You can mark the page where you have added the product table as private. By default, private pages only appear to logged in Administrators and Editors but you can use a plugin such as User Role Editor to make private pages available to other user roles too. Instead of making it available to logged in users, you could password protect the page. 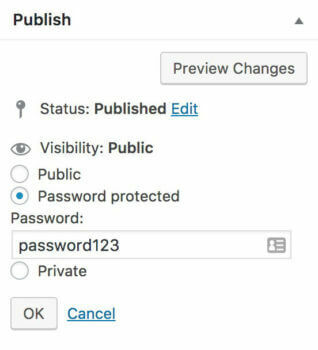 You can password protect pages or mark them as private using the visibility options in the Publish section at the top right of the add/edit page screen. This will protect the page containing the product table, but it will not product the individual products within in it, so people could still access them directly. ​If you want to hide individual products, categories etc. then it’s safer to use our WooCommerce Private Store plugin (if you want to protect your whole store) or WooCommerce Password Protected Categories plugin (if you want to protect specific parts of your store). You can use these plugins with WooCommerce Product Table if you automatically add product tables to your shop or category archive template.